OK so … one of the points of frustration for me as a beginning Buddhist is having trouble finding LIVE support. You know, someone to talk to about what I need to know, ask questions to about what I’ve read, someone to simply learn from. I believe they’re called “Dharma Friends,” from what I’ve picked up through listening to various podcasts (see? this is what I mean!) Someone who helps you walk along the path, basically, and serves as a guide to those who are starting out and learning the basics. Definitely, from what I’ve seen, Skeptical and Secular Buddhism are budding branches of this philosophy. There seems to be groups in some of the larger metropolitan areas, looks like maybe on the West Coast of the U.S. and Canada, and maybe the Mid-West? Not sure. Either way, all I can say is that in my neck of the woods — rural Central New York — I can only find one reference to Buddhism, and it’s some kind of really heavily ritualized form of Buddhism. Not my bag. So where have I gotten what I know so far (which isn’t much, really)? Online, mainly. The most valuable information I’ve picked up has come from the almost-real interactions of the 3D virtual world — Second Life. There have been other sources of information too — podcasts, books, Web sites, face book pages and more. All of those, however, are limited in the sense that it is a one-way conversation — the author talking to me, or the interviewer and interviewee talking to each other. I, however, get no opportunity to interject, ask questions or take part in the conversation. As an educator, I know that most learning comes from active, social situations in which students get the opportunity for some give-and-take. That’s where Second Life has come in for me. Like I said, 3D virtual world, and yes, the sordid stories you MAY have heard about some of the goings-on there are true. Let’s make this clear: Second Life is the Internet, 3D, and you do interact with others who are surfing in this 3D manifestation of this world. So whatever, and I mean WHATEVER, you can find on the Internet, you’ll find there — the good, the bad, and the ugly. I’ve chosen to go with the good, and use SL as the one and only place where I can have a Sangha — a group of practitioners with which to meet and from whom I can learn. In Second Life, I’ve been lucky enough to find two great groups — Skeptical Buddhists’ Sangha, and Secular Community. They have both been instrumental in putting me in touch with some valuable information and support in my early stages of learning about Buddhism. Unfortunately, those who run and organize the meetings for these groups seem very busy in RL (real life), and haven’t had many meetings lately. So, in my desperation, I created a reading group in SL, specifically for beginners like myself. Our first meeting for this reading group (Skeptical Readers of SL) was on Sunday, and I was really excited at how well it went. It definitely wouldn’t have gone as well had it not been for the support of Sung Hifeng (his SL avatar’s name). This is what I mean about support from virtual sources — he’s clear across the other side of the country from where I am, but he was able to “sit” in a “room” with me, help me gather other like-minded individuals to meet us in SL, and talk about our first reading, answer questions in REAL-TIME (none of this posting and waiting for hours and days for a reply stuff) about what we should read, when, how, etc. I’m really excited about this group, and I’m hoping we can gather a few more people for the next meeting, which will again be on Sunday at 5:30 p.m. PST (that’s the time they operate on in SL). We’ll be talking about Chapter 1 of “What The Buddha Taught” By Walpola Rahula, and I know that I’ll get so much out of the give-and-take that will take place with everyone! If you are reading this, and want to consider joining SL, or if you already play SL and want to join us next week, I hope you do! Feel free to look me up in-word and ask any questions. My avatar’s name is Ryuko Naminosaki. … Well, I’m just going to jump in where I am — the beginning, or close to it. I’m a mom, wife, teacher, and recently have become a student of Buddhism. Specifically, I’m a practitioner of what’s called Secular or Skeptical Buddhism … I think there’s some kind of difference between the two, but to be honest, at this point, I couldn’t quite tell you what that difference is LOL! That’s precisely what this blog is about: The learning that takes place while on the journey on the path toward what all Buddhists are working to attain, which is Enlightenment. I’m hoping to slowly put together a somewhat organized source (for myself and for others), of information for those just starting their studies/research/journey on Buddhism from the Skeptical/Secular point of view. I actually, believe it or not, grew up with an awareness of Buddhism. My father is a scholar of classical Japanese literature, and my mother is a Japanese immigrant — although at this point she’s been thoroughly Americanized. In any event, Buddhism has always been a part of my background. I grew up with some stories, with a vague knowledge that it had an influence on my life, but that was it. It wasn’t until I began to seek out my own answers to spiritual questions that I really began to look more closely at Buddhism — really, I’d looked at Buddhism only after I’d already looked at Christianity from various angles, and even read parts of the Koran and looked at Taoism. While examining those religions independently (read: from a complete layperson’s point of view. I’m NOT schooled in theology or philosophy in any way whatsoever), I formed my own set of ideas and philosophy. Honestly, I saw so many common threads between all those religions I began to wonder what all the arguments were about, REALLY. Then I caught a glimpse of Buddhism, and was taken aback by how closely the point of view I’d developed on my own, matched that of Buddhism. So I read on. All that was while I was in university. After a hiatus during which I pursued careers, marriage and toddlers, I’ve once again found the time to look at Buddhism, and am elated to find this school of Buddhism that believes in approaching it from a Skeptical point of view — that is to say, to examine what the Buddha ACTUALLY taught, and to approach his teachings from a non-mystical, non-ritualistic, and non-dogmatic approach. As a beginner though, I have to say, that THIS IS HARD STUFF! There ARE resources out there that I’ve found helpful, including podcasts, web sites, facebook pages and even an virtual Sangha in Second Life (which, for those who are not familiar, is a virtual world in which people from all around the world can meet and create avatars which can communicate and interact with each other in real-time. More on that another time). Living in conservative, rural America, it’s difficult for me to learn much about Buddhism, let alone Secular Buddhism. In my area, there are no Sanghas or meetup groups for this particular branch of the philosophy. The online resources that are out there, and those individuals who DO help out and have information are — I’m going to just spit it out here — very academic. Half the time, I’ll read one paragraph over about oh … let’s say … five times, just to make sure I KIND OF understand what is being said. I’m pretty certain I still get it wrong most of the time, and feel like a dolt making comments or asking questions that seem way, way, WAY more basic than anything else that is being posted on those sites. It’s NOT EASY being a non-academic, un-scholarly Secular Buddhist who is just starting out. Don’t get me wrong, I know I’m smart, I’m just not an academic, if you know what I mean. I need things spoon-sized and fairly easy to digest. I’ll catch on quickly when information is delivered that way, and I’ll be quick on my feet in a debate or exchange of ideas (once I latch on to them), but my words may be … ah … simple. I have to think that I’m not the only one like this who is on this journey of Skeptical Buddhism! I don’t mean this to be critical, either, of the Skeptical or Secular Buddhist groups or practitioners! I believe the resources and individuals out there are outstanding — anything I’ve ever asked or said has been responded to WELL, and with great care to making sure I understand what is being said. 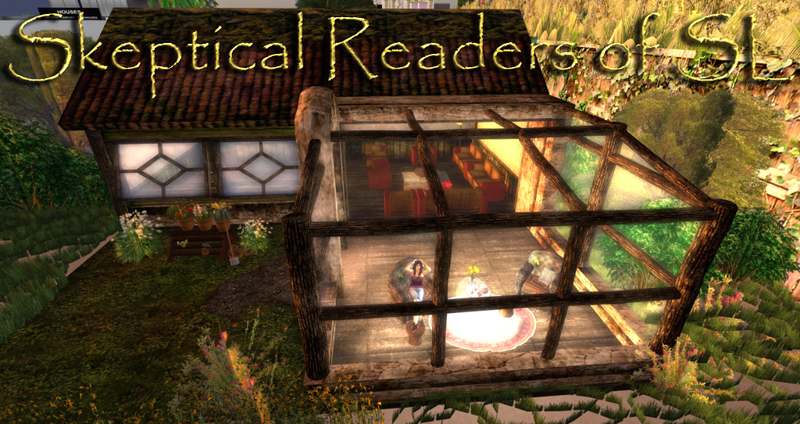 When I came up with the idea of creating a Reading Club geared toward beginner Buddhists in Second Life, I received a lot of encouragement and support from those in the virtual Sangha. The secular community is a wonderful, accepting group of people of which I am happy to consider myself a member. Simply put, I hope I can fill in the place of being a stepping stone toward getting to where those people who have been helping me are — hoping to be the first rung of the ladder, shall we say. The bottom rung! LOL! If you read all this, THANKS. Hopefully I’ll talk to you soon. You are currently viewing the archives for September, 2010 at One Step At A Time.